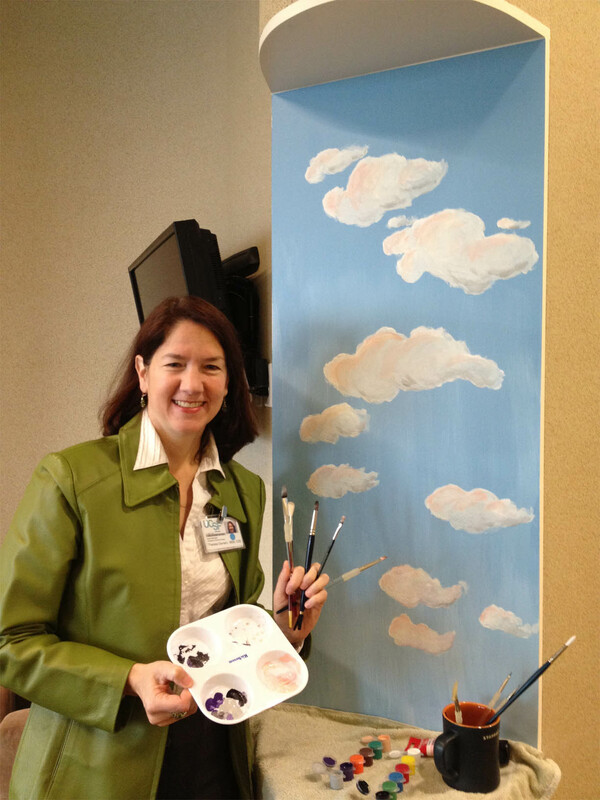 When manager and pseudo-artist Theresa Garnero saw the white canvas behind the talented glass installation of Kana Tanaka, she thought to add some depth and whimsy to the Madison Clinic entry way. The idea for clouds was more of a concept to represent how we are all unique, going in our our direction and yet in our togetherness, there is added beauty. And in life, there are many clouds and it is in the perception of how you look at them that changes ones experience. As Kana describes her art installations, "I incorporate light phenomena in my installation pieces. Instead of making simple objects, which the viewer looks at, I create experiences that surround the viewer and affect their senses, directly and broadly. By means of exaggeration, amplification, distortion and division, I seek to generate new perceptions. Viewers become part of the work as they interact with it and observe light." The glass reflects whatever is behind it in an upside down format. Now with the added backdrop, families can interact with the combined glass and cloud instillation just by walking by and watching form change within a split second. Enjoy the progression of how the clouds came to life.